My grandmother was a lifelong reader who had a quirky little habit of rating a book she’d just read. On the inside front or back flap, she would put a little star if she especially liked a book, followed by her initials–“MB”. She was kind of stingy with the stars but I remember some of the books she loved–Came a Cavalier by Francis Parkinson Keyes, the “Rhanna” series of books by Christine McDonald Fraser, Captain from Castile by Samuel Shellabarger. There was one special book that rated not just a star but an exclamation point, surely the highest praise from a very particular reader. I remember finding that book on her shelf when I was just a girl of perhaps twelve years old. I was intrigued by the interesting cover art, which resembled a French advertising poster, and even more intrigued by the title of the book: Dandelion Wine. There was another set of initials endorsing this novel–“CLB”–my mother. I figured a book beloved by both my grandmother and my mom couldn’t be half bad, and so I read it. Dandelion Wine turned out to be the kind of book you fall into, starting with the first page. There’s something about the voice and timeless sense of place that draws the reader into that fictive dream, that alternate reality we find so absorbing and comforting. I’d always been a voracious reader–that annoying toddler foisting The Pokey Little Puppy on any unsuspecting adult who would read it to me, the self-important first grader reciting Yertle the Turtle by heart, the geeky twelve-year-old obsessed with Anne of Green Gables and her torrid affair with Gilbert…but Dandelion Wine was even more powerful. As soon as I finished reading it, I turned right back to page one and read it all over again. Afterward, I very stealthily found a pen and added my own initials to the back flap of the book, then returned it to my grandmother’s shelf of beloved favorites. As the years went by, her eyes grew dim and her penmanship grew spidery and indistinct, but her love of books and reading never flagged. She lived to the ripe old age of 95, and when she passed away, she left behind a small but beloved collection of books. Things were crated up and shuffled around as things have a way of doing, and passed among various family members. My own daughter, Elizabeth, turned out to be as avid a reader as her predecessors. Each year, I tried to find a special book to give her, one that would go on her keeper shelf–a signed edition of Grandfather Twilight by Barbara Berger, A Wrinkle in Time by Madeleine L’Engle, The Golden Compass, Harriet the Spy, Treasure Island. One Christmas, not long after my grandmother died, I was sorting through belongings–okay, clutter–when I came across a box of books. And in the box I found the perfect gift for my daughter. My grandmother’s original copy of Dandelion Wine. It didn’t look like much by then. The cover art seemed lackluster, the pages had yellowed, but it was a special joy to show her the initials of my grandma, my mother and the twelve-year-old me, carefully inscribed in the back of the book. In time, she read the novel too, and added her own initials to the list. More time passed, and Elizabeth went away to college, pursuing her own writing career with a well-received funny memoir about planning her wedding with yours truly. [www.howiplannedyourwedding.com] And again, books were boxed up and lsost in the shuffle, but Dandelion Wine resurfaced just a few years ago, looking tattered and worn, the way a well loved book should look. Even better, it had four generations of readers’ initials endorsing it. On a whim, I scanned the cover and back flap, and sent the picture to Ray Bradbury with a letter telling him this story. As an author myself, I know what it means to hear from readers. 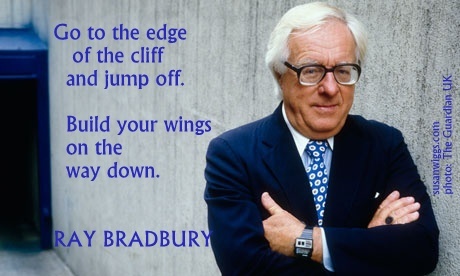 To my amazement, I received a note back from Mr. Bradbury, who was 85 at the time. He enclosed a poem he’d written and signed his name to. It was one of those moments–unexpected, unasked for…and indelible. Wishing you nothing but joy in the new year.